And Another Thing...: A Ballet Binge! It's PNB's Jerome Robbins Festival! A Ballet Binge! It's PNB's Jerome Robbins Festival! PNB Principal Dancers Seth Orza and Noelani Pantastico in Jerome Robbins' "Other Dances." If you’re a regular at Pacific Northwest Ballet, you’ve had the chance to experience work by a bevy of choreographers. You’ve also gotten to dive more deeply into the dances of William Forsythe, Twyla Tharp, and of course, George Balanchine. 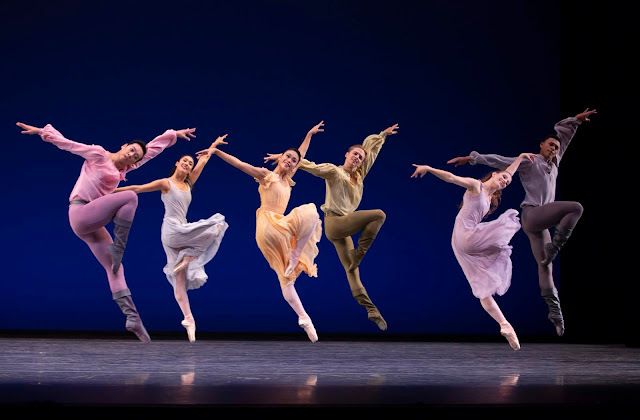 But PNB’s two-part celebration of Jerome Robbins' centenary, continuing this weekend at McCaw Hall, is something new and most welcome. Although PNB presented only seven of Robbin’s many ballets, the chance to see them in this format was exhilarating and illuminating. PNB Artistic Director Peter Boal, who worked with Robbins during Boal’s tenure at New York City Ballet, has designed two unique programs that share only one dance—a brief bit of cotton candy called “Circus Polka,” featuring 48 young girls and a ringmaster (Peter Boal on opening night). Program A features four other Robbins’ dances: “In the Night,” a work for three couples set to Chopin piano music, “Afternoon of a Faun,” a haunting pas de deux inspired by Vaslav Nijinsky’s 1912 work, the iconic “West Side Story Suites,” and a new to PNB pas de deux, “Other Dances,” originally created by Robbins in 1976 for Mikhail Baryshnikov and Natalia Makarova. I could write at length about any of these four ballets. Each is distinctive and we've seen most on other mixed bills. Seen consecutively on a single program, they provided so much insight into Robbins’ aesthetic. “In the Night” is actually three separate duets about relationships. Leta Biasucci, (newly promoted to principal dancer) floated in new love with Ben Griffiths. 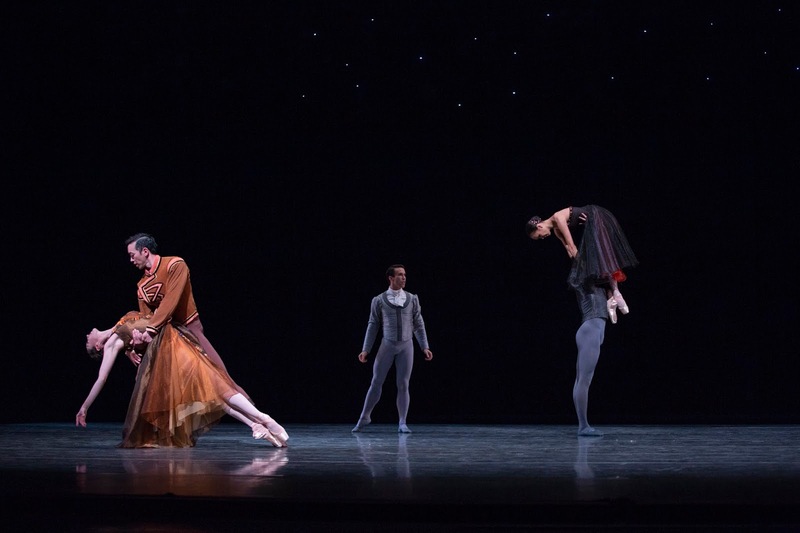 Laura Tisserand and William Lin-Yee were more earthy; Jerome Tisserand with Noelani Pantastico were fireworks onstage, enacting a passionate and volatile couple. Pantastico was equally dazzling with Seth Orza in “Other Dances.” It must be hard to tackle work created on such stars as Makarova and Baryshnikov, but that didn’t seem to daunt either PNB principal. Orza was solid as always; Pantastico moves across the stage like a smooth-flowing river. Watching her, I don’t think “wow, that’s hard,” or “wow, look at that intricate lift.” Well, I do think those things, but mostly I am awed by the way she owns the dance and the music, melding her body with it all so that the sum is greater than any single part. Watching a dancer at the height of her artistry performing work created by a choreographer at the height of his own is reason enough to go to the Robbins’ Festival. Program B offers its own compelling draw: “Dances at a Gathering,” created for NYCB in 1969. Many dance writers acclaim this work for ten performers as Robbins’ ballet masterpiece. Set again to Chopin piano (performed by Christina Siemens), “Dances” examines human relationships and emotions in their varied forms. From Lucien Postelwaite’s almost wistful entrance to Kyle Davis and Noelani Pantastico’s intricate and demanding scherzo, “Dances” provides the PNB dancers with an opportunity to shine. They didn’t disappoint. I expect PNB’s principal dancers to excel; in addition to Pantastico and Postelwaite, the family Orza (Seth and Sarah) provided some breathtaking work. I mean that literally. At one point, Sarah Orza is lifted into the air then spun around like a baton. She ends up head down, legs together straight up in the air. What??? In fact, the lifts, throws and carries in this work deserve their own essay. They are intricate, thrilling and, in the hands of these dancers, masterfully executed. God I love this photo by @Angela Sterling! Watching “Dances at a Gathering,” I couldn’t help but think about the prior evening’s performance of “West Side Story Suite,” when the entire ensemble takes the stage to the song “Somewhere.” In “Dances” the ensemble enter in a similar fashion, strolling to their marks, almost the way people walk into a room in non-ballet life. The pieces couldn’t really be more different, and yet, they share a freshness, almost an American-ness, if there is such a thing. Years ago, a Frenchman I know told me he could always tell an American; he said we have open faces, we smile more than Europeans, we anticipate the possibilities. I don’t know if that’s still how he thinks about Americans, or if he meant only white Americans. I do know that Jerome Robbins’ dances have that same feeling of anticipation and possibility. Even the Part B closer, "The Concert (or The Perils of Everybody) has a silly, slapstick anything-goes quality. 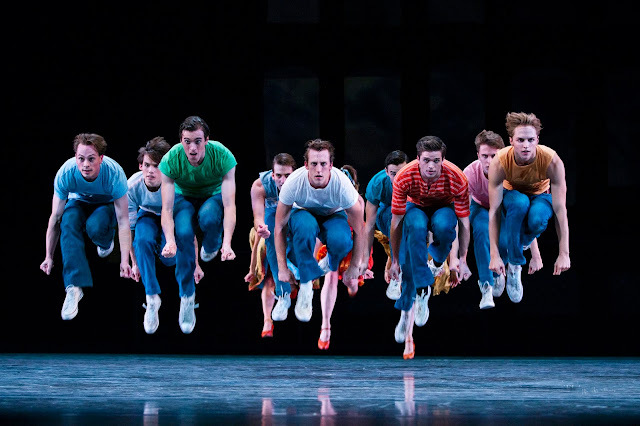 The characters in this dance are more "Fancy Free" than "West Side Story," but they share that quintessential American quality of hope for the future. If I had any quibble with PNB’s Robbins Festival, it’s that it’s not comprehensive enough. Where were “Glass Pieces” and “Fancy Free?” And the 60-odd other works we didn’t get to see? 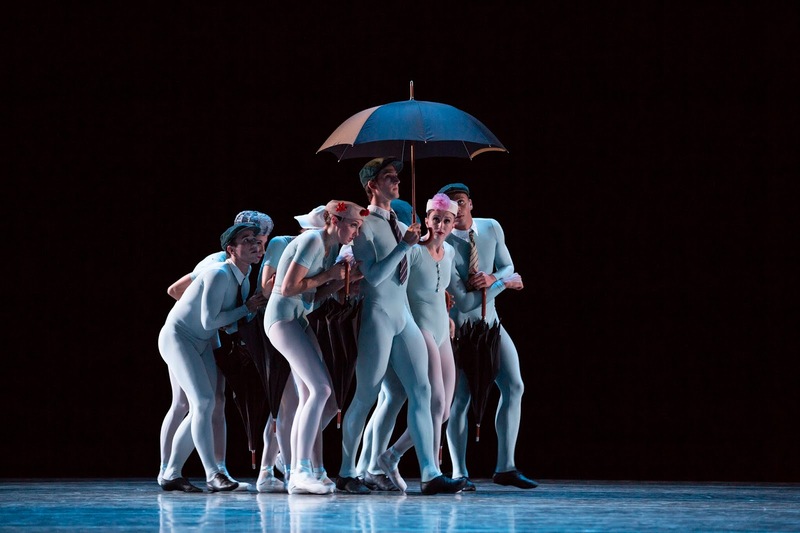 Miles Pertl, with umbrella, and PNB company members in a scene from "The Concert"
That may have to wait until his bi-centenary. For now, you still have a chance to catch the Jerome Robbins’ Festival September 27-29th at McCaw Hall. By the way, Program A only has one performance, Saturday evening the 29th so get your tickets now. © Marcie Sillman. Window image © Cat-in-the-Stock (http://cat-in-the-stock.deviantart.com). Simple theme. Powered by Blogger.